Or get the Jubilee Edition Deck & Book Set. Or get the original, expensive, gilt-edged version. Measurements: 3.1 x 5.5 inches; or 79 x 140 millimeters. Back of card: Gold, with white border. Fancy geometric design turns out to be Dali's signature, repeated maybe a hundred times. Can be inverted. Publisher: NEGSA Naipes Comas & Tallers Grafics Soler (both Barcelona, Spain), and Koenigsfurt Verlag, Krummwisch, Germany. Cards printed in Spain, box printed in Germany. Comments: A Canadian customer wrote to say that Dali created the deck as a love offering to his Russian wife, Gala. According to her, each card has three layers: The "top" layer draws upon classical western art. The second layer is the traditional symbolic meaning. The third is a "shadow" layer, called an ecoplasm. On some cards Dali parodies himself & his work, such as the Magician card featuring Dali himself & the famous "melting watch", above. If you're curious, the deck did nothing for me. I seem to have tired of Dali some time ago, which is my loss. Apologies. 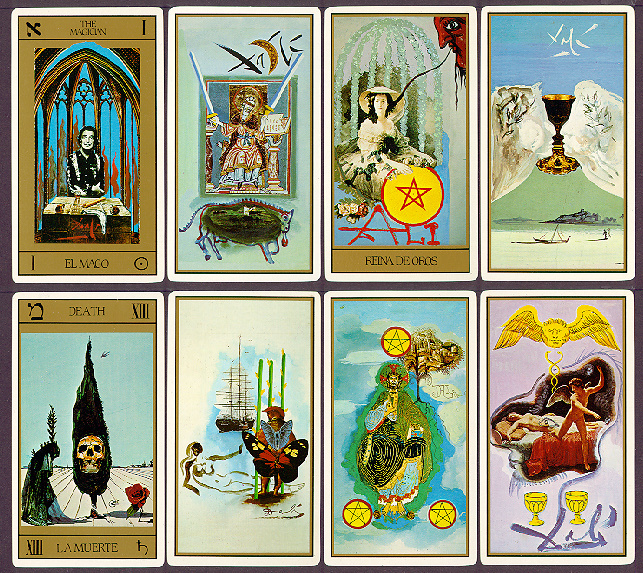 The book, Dali Tarot, by Johannes Fiebig, was issued on the 100th anniversary of Dali's birth (1905 - 1989). It has 192 pages & measures 5.9 x 8.65 inches, or 15 x 22 cm. Each card is shown in full color, on a full page (larger than the actual cards). The interpretations for the cards are elementary in nature & do not cover inversion. Of interest are the biographical notes on Dali, his life & times, and how he came to produce his remarkable tarot deck. Source materials for all the details shown in the cards are given, so far as they are known. Regrettably, I could not find the word "ecoplasm" in the book.